Cookistry: Need Self Rising Flour? Mix your own! 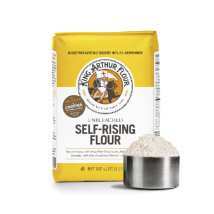 Self-rising flour is a handy thing to have on hand if you tend to make a lot of biscuits and quick breads and other recipes that specify self-rising. 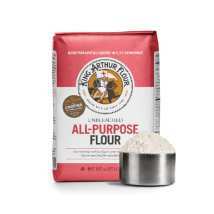 I happen to like King Arthur's self-rising flour, since it's made from a softer wheat than typical all purpose flour. Unfortunately, it's not always available at my local store. The good news is that self-rising flour isn't a magical or complicated product. It's easy to mix it up yourself. Sure, you won't get the benefit of the softer wheat flour, but that's not going to kill a recipe. If I'm not planning on making multiple recipes that require self-rising flour, I mix just enough for a recipe or two. When I know I'm going to be making a lot of biscuits and similar goods over the next week or so, I mix up larger batches. This stuff doesn't go bad quickly, so you don't need to fret about leftovers that hang around for a few weeks or even a few months. Combine all ingredients and whisk well to distribute the baking powder through the flour. Or, if you prefer, you can sift it together. Store the same way you store your flour. Stir or sift the ingredients together well so that the baking powder is evenly distributed in the flour. Store the same way you store your flour.